I know what you are thinking, that is a pretty big name for a pork tenderloin recipe. But this recipe really did result in the best pork tenderloin I have ever had in my life! (And I have eaten pork tenderloins, prepared in many different ways in my lifetime.) The flavors from the marinade are incredible and they seem to seep their way into the meat, it was super moist since you cook the tenderloins right in the sauce, and it was cooked absolutely perfect. My husband and I could not get enough. We each ate over a half pound of pork and chowed down on the cold leftovers for lunch the next day. The flavors are sweet, tangy, and garlicky. Awesome, awesome, and more awesome. If you are looking to mix things up in the kitchen I highly recommend you give this recipe a try. Your mind will be blown and your palette and belly happy. Spray an 11” x 17” baking dish with cooking spray. Use a sharp knife to poke 6 holes along the topside of each of the tenderloins going about an inch deep. Push a sliver of garlic into each hole and place the tenderloins in the baking dish. In a small bowl whisk together the soy sauce, mustard, honey, juice, rosemary, pepper, and olive oil. Pour the marinade over the tenderloins. Bake uncovered for 45 minutes basting every 7–10 minutes. This gives the tenderloins a delicious glaze over the top. Transfer the tenderloins to a large cutting board and allow them to rest for 10 minutes before slicing. Thinly slice the tenderloins and transfer to a serving dish or plates. Drizzle the marinade from the pan over the sliced pork medallions and enjoy! Recipe adapted from Lick the Bowl Good. This was amazing! My husband said he’d need this every week. Thanks so much for sharing! What side dish do normally have with this? Loved this recipe- had it several times and the sauce is perfect! I always keep a pork loin on hand ..when I’m at a loss, I know this is a great “go to” meal. I pair it with asparagus and organic rice..all goes well with this sauce! There’s never any left-over..lol TYTYTY! Can i replace the orange juice with anything?? I used mango orange v8 energy juice as I had no oj. Good!!!!!!! My family DID NOT LIKE rhe sauce, way TOO SWEET! I’m sorry to hear that! This has always been a favorite in my house. If you want to try it again perhaps consider leaving out the honey. That would certainly help cut the sweetness. Hopefully you can find some other recipes on my blog more to your liking. Wow! I hadn’t thought of pineapple juice. I bet that is an amazing flavor to add. Yum yum! Thanks for the idea! I will definitely give that a try sometime. If I am only making 1 tenderloin, do I still cook for 45 mins at 350? Is it a single 2 lb tenderloin? If so, I recommend going slightly longer. If it is just a 1 lb tenderloin then it should be fine going for the full 45 minutes. Hope you enjoy! I would say up the cook time to 60 minutes for the larger cut. Just be sure the thermometer reaches 145º in the thickest part of the roast and let it rest for another 10 minutes after removing it from the oven to continue cooking. Enjoy! Made this yesterday and it was fantastic!!!! Thank you for sharing! Delicious! I made this tonight but used maple syrup instead and marinated it for the afternoon. Will definitely be making this again. Amazing! The pork was so moist and flavorful. I made a lot so it lasted a few days. I have never had meat that tastes just as good 2 days later!!!!! I know! I love the leftovers from this recipe! It’s even good cold! I personally really think it needs the little bit of sweet acidic juice. Someone else has posted that they substituted pineapple juice. I bet that would go great! Even if you have a can of pineapple you could drain the juices from. Enjoy! Hi, I want to make pork tenderloins for our Christmas open house and serve them at room temperture, thinly sliced on small bakery buns, would this recipe be good served like that? This other recipe has lots of flavor and goes great with a little Sriracha mayonnaise. Baking this right now! Smells and looks so good. One question. Does the sauce normally burn to the pan? I’ve been basting and the outer edges of the pan is turning into burnt soy sauce. I’m almost positive there will be no sauce to coat once they’re done. I am making for 20 people so how big should I get then how do I alter cooking. Are you cooking for a certain time per pond? If the meat is the main feature with only a few side dishes, I recommend about 3/4 pound per person. If the side dishes are more substantial, you could probably go with 1/2 pound of meat per person. A pork tenderloin typically needs to cook about 20 minutes per pound at 350º. The biggest thing is making sure the internal temperature in the thickest part reaches 155º. You can’t possibly have too much of the sauce so be sure you make plenty. Hope that helps! Enjoy the dinner and a very happy holiday to you! I made this last night and it turned out wonderful! 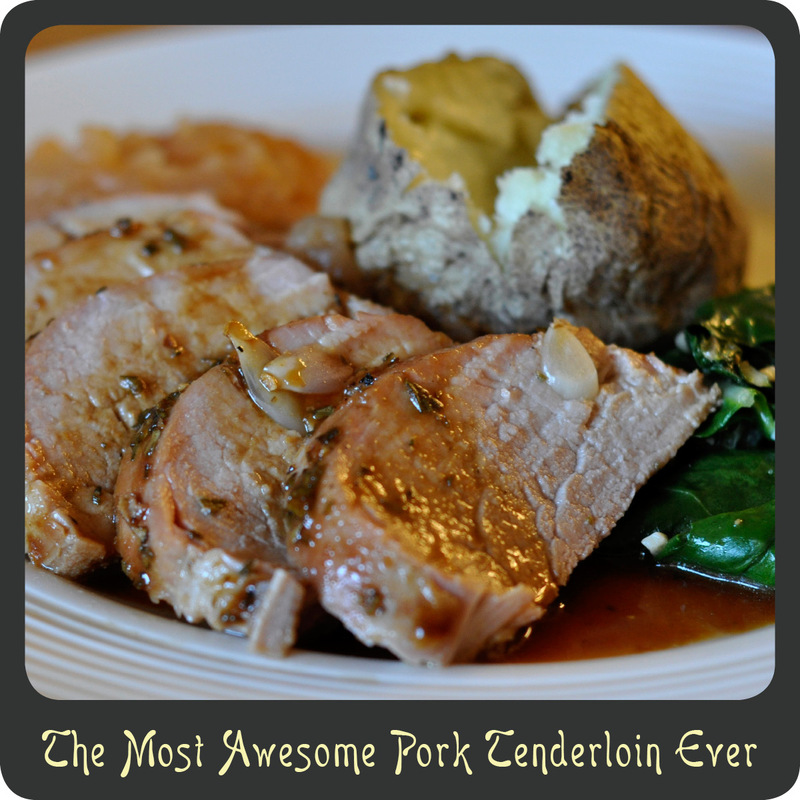 I liked the different flavors it gave then the other pork tenderloin recipes I have tried. I served it with rice pilaf and it was a nice combination. I did think I could taste too much olive oil though, so I think next time I might make it with 2tbsp instead of 3 but that’s just getting picky! The pork was so juicy! Thank you for this recipe, it is definitely staying in my rotation of monthly meals! YUMMY!! Awesome! Yes, I too love the flavors in this recipe. When you see the list of ingredients you might be skeptical but it always turns out so tasty! Thanks for letting me know your thoughts about this recipe. Have a wonderful day! I made this the other night and it was to die for! Seriously the best pork tenderloin I have ever had! My entire family couldn’t get over how delicious it was. Even made a sauce/gravy with the remaining juices and served it over mashed potatoes. Yum yum yum! This was delicious!!. It was easy to made and a hit with my family. Thanks for sharing a great recipe. Wow, what a great recipe! I served it on a bed of spicy Thai noodles with a side of fresh salad spring rolls with a sweet chili dipping sauce. It was a big hit with my family. Will definitely be be making this again! Many thanks for an awesome recipe Rebecca! By basting, do you means with the fats and juices that are cooking with the meat? Or do I make extra sauce to bast with? Thanks! Yes, I just use the juices in the pan to baste. There should be plenty. Sometimes if I want sauce for mashed potatoes or anything else I double the sauce recipe. There’s really no substitute for the flavor soy sauce adds to this recipe. However, I have seen recipes online for making your own mock soy sauce using bullion and vinegar. Perhaps take a look at making something like that. I didn’t have soy sauce either. I substituted by using 2 Tbsp of Worcestershire Sauce and 1 Tbsp water. It worked out great! Can you use dried rosemary? Definitely! Just be sure to use half as much when substituting dried herb for fresh. Dried herbs typically are much stronger. Can you taste the Dijon in the final product? I don’t like the actual taste of Dijon but don’t mind using it in cooking. Nope. I don’t think you can really taste the Dijon at all! Oh boy, this is a good one! The only thing I did differently is I marinated the pork for 1 hour before roasting, and boiled the rest of the marinade before basting – unbelievably great! Thanks for the recipe!! We were planning on grilling our pork tenderloin last night and at the last minute realized our gas tank had been leaking and we had no propane. I was in a mad dash to find a recipe I could do in the oven and I was thrilled when I found this recipe and knew I had all the ingredients needed! It turned out AMAZING! We all loved it! I think this sauce would be equally as good on some chicken thighs! Thanks for saving dinner! At the very bottom of the recipe there are some “buttons” for Facebook, Pinterest, etc. There is also a print button. If you click that you should be able to print the recipe easily. Hope that helps! When you press ‘print’ to get the recipe EVERY comment prints out! I just printed about 12 pages that I don’t need! Be careful. However, the recipe is awesome. What could I use instead of rosemary? Thyme and tarragon are both also savory herbs which would be decent substitutes. I just made this tonight, and it was amazing! So tender and flavourful, and I didn’t even have rosemary. My husband says it would probably be even better with, most likely going to make this again next week too. Thank you for sharing the recipe! hi, can you marinate this over night? Just slid the tenderloins in the oven. I’m going to fry some sweet potatos and Ihave some fresh green beans going. Cant wait to try it! Should the rosemary be strained out of the marinade before pouring over the pork loins IF I’ve marinated them in the mixture for a few hours? The rosemary is chopped fine, but how does it taste? I guess I’m concerned of little “crunchy”, unappetizing bits of rosemary in the sauce!! I don’t think it is necessary to strain the rosemary. I’ve never had issue with the bits. They become tender after cooking in the marinade. Hope you enjoy! Fantastic! This immediately made it into our regular dinner rotation after the first try–4 months ago! Everyone loves it. Thanks so much!! You are welcome! So awesome to hear! You’re not kidding. This really is the best pork tenderloin I’ve ever had! Made it last night and it was a HUGE hit. Can I use this recipie on a half loin of pork? Of course! You may just need to alter the cooking time slightly. As long as the thermometer hits 160º you should be good! I was wondering, what would you say the serving size is for this recipe? The recipe calls for 2 lbs of pork. I’d say people typically eat 5-8 oz per serving so this recipe will feed between 4-6 adults. A little mustard seed would be a good substitution if you have any of that on hand. I want to make this with a 1 lb tenderloin and using convection bake (or roast?) feature on my oven. Should I alter at all? You definitely need to alter the cooking but you can do that in one of two ways. Either lower the temperature by 25º, OR knock 10 minutes off of the cook time. Hello! This recipe looks great and I can’t wait to try it. Was wondering if there was anything you could substitute for the mustard. We just don’t eat or like the taste of it. Thank you so much! I need to make this with 5 pounds of pork tenderloin, 2 packages with 2 tenderloins in each. I figured I could double the recipe and put it in a large pan. Will this work? So excited to try this for New Year’s Day! If I need to cook three packages (6 small tenderloins) or around 7.5 lbs, do you have a recommendation for cool time? Have you made this many before? Was thinking of doing two dishes with three tenderloins in each. Your guests will love it! I have never cooked that many. Perhaps you mean cook time, and not cool time? I would recommend cooking (and cooling) per recipe instructions. It really comes down to the internal temperature of the meat so just be sure to check it after the time is up and every five minutes there after if need be until it is up to temperature. Wishing you a wonderful 2016! Enjoy! I’m going to try cooking in crock pot. I didn’t have soy sauce so I used balsam wine vinegar, plus I added onion & garlic & 1/2 cup of red wine. Cooking now I’ll let you know. I like to tweak recipes once I have a basic recipe. We LOVE this recipe! Thanks much for sharing. ..great combination of flavors. It’s become our favorite tenderloin recipe. My husband’s a beekeeper, so we enjoy finding recipes that make good use of our honey. Thanks again! Just finished dinner. My family said they loved this recipe. 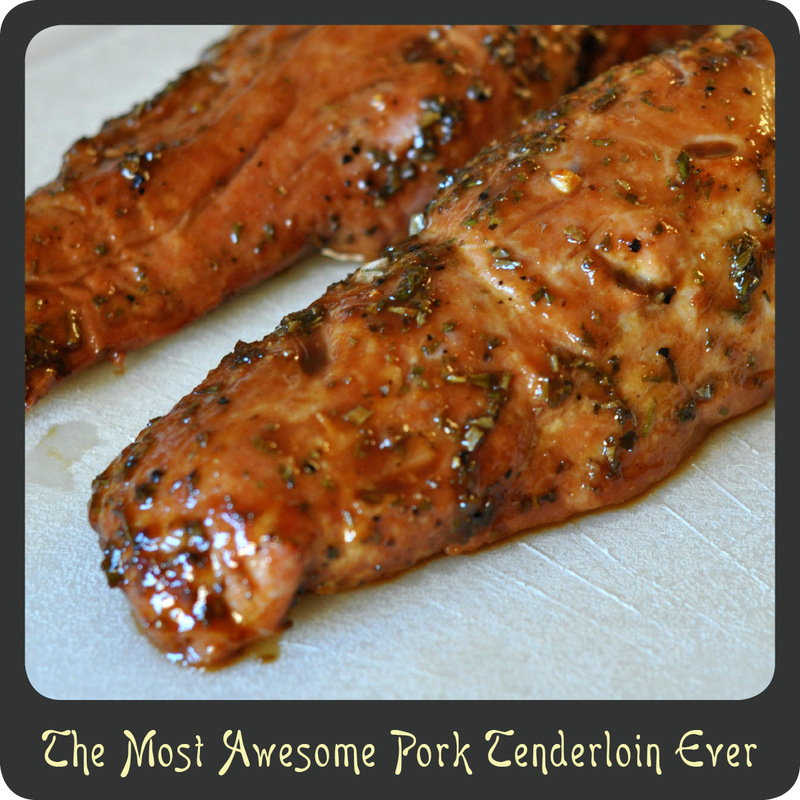 I have been making the same pork tenderloin recipe for years and now this is our new favorite! Wow! That is quite the compliment. Thank you! Glad it was such a hit with the whole fam. Can we put this in crockpot? Your thoughts on making it one of those Reynolds bags. Thanks for the recipe. Looks delicious and simple. A lot of recipes I’ve seen for Pork Tenderloin require searing before putting in the oven. Do you recommend this? I’m making this tonight, My side dish are steamed Brocolli, steam corn, some toss salad. for Dessert Cream puff. does this sound okay!!!! Do you have the nutritional information for this? It is divine!!! Thanks! This is the most amazing sauce and marinade. Instead of using orange juice and honey, I substitute orange marmalade. It is just outstanding! I was looking for a good tenderloin recipe…. Search is over! This was easy and amazing. Thanks for sharing! I wonder if I could use turkey loins with this recipe? We are not pork eaters. Definitely! I imagine those would be great! Just be sure to adjust cooking time accordingly as turkey loins are usually smaller. Can I marinate pork overnite ? Our new family favorite. Thank you! This was amazing! Definitely worthy of serving to dinner guests. The sauce was delicious. We served it over basmati rice. Will be making this again and again! Good enough to impress guests! I hope you like it as much as my family and I do! Nutritional Values show 22 carbs Don’t understand why so high? I’m going to marinate the tenderloins in the sauce 5-6 hours, save and boil the sauce, then cook them uncovered in the sauce, basting every 10-15 minutes, in my smoker at 350°. I’m betting they are killer good. More later. Thank you SO much for posting this recipe! It is truly amazing. It is so going in my recipe book permanently! Thank you!! 45 MINUTES IS TWICE AS LONG AS I’VE EVER COOKED A PORK TENDERLOIN. IS THAT WHAT YOU ACTUALLY DID? Yes, that is correct. I have always cooked my tenderloins for at least 45 minutes but most importantly you want the internal temperature to reach at least 145°. I’ve made this recipe dozens of times and it is never turned out dry. Perhaps you typically cook your tenderloins at a higher temperature? Prior to this my husbands favorite meal was the pork and dumplings his grandmother made when he was young. Though I tried and tried mine never was as good as granny. So I gave up. I saw this recipe while searching for recipes for pork tenderloin and decided to try it. My husband says this is the best pork he has ever eaten. I am making it again tonight! Definitely! However, after marinating I would probably take half the sauce and put it in a pan to simmer so PU have a sauce for serving and use the other half to baste while it is grilling. Enjoy! Can this go on the grill? How many servings does this recipe make? It looks delish and I’m looking forward to preparing it. I’d say it serves 4-6 adults. Enjoy! We absolutely love this recipe. Every time I make it for someone they rave about how tasty it is and love the sauce too. I’ve never written a comment before but your tenderloins are absolutely amazingly delicious. Thanks so much for sharing with all of us. Do you recommend letting the pork marinate prior to cooking? If so for how long? I like to let it marinade for a bit but it is not required. I have let it sit anywhere from 12 hours to 5 minutes and still get great results. Can you roast the pork in the same marinade that you used to marinade overnight? Absolutely! You will use it to bast the tenderloin while it cooks. I made this last night and everyone loved it! My husband asked why I don’t make this more often. I made it for 3 people and there was barely any left overs, but the leftovers were even better, since it sat in the marinade. Thanks for the recipe! Tender, delicious. I marinated for a few hours just because I had the time. Made only 1 tenderloin (2-3 people) but kept marinade as written. 1/2 way thru cooking added a tiny bit of water to bottom of pan. Timing is perfect. Loved the sauce, the Asian taste. Next time might add some ginger to marinade and garnish with chopped scallions. Served with rice. Bright green would be nice…snow peas, bok choy? We tried this recipe today and it does live up to the tittle. It is delicious and easy to make. Made this tonight, holy crap best pork tenderloin ever. The sauce was to die for! Next time I’m doubling the sauce because some burnt off in the pan while cooking. So easy and so delicious! Hi, just checking on the cook time. 45 minutes seems too long, yet no reviews stated a problem. My tenderloin package is 2.25 lbs total. Each piece just a tad over a lb. I normally cook about 20 min per lb Since the meat is already in 2 pieces, is 45 minutes correct? Looking forward to making this, sounds great! Thanks! I’ve always cooked it for 45 mibutes and have never had a problem. If you are concerned about it being overlooked just check the temperature midway through cooking. We are pork lovers but don’t like rosemary. Should I leave it out or do you have a suggested substitute ? Thank you. I would probably substitute thyme. I too am out of orange juice and substitute lemon juice and added a bit more of honey. AMAZING!!!!! Hello, I am very excited to make this for Thanksgiving this week! With just my husband and myself we don’t like to cook a turkey, so pork it is! I do have a question as I really never cook pork – I have two loin chops, each slightly over 1 lb. Would this work? And would you recommend altering cooking time at all? What an honor to have my recipe served for Thanksgiving! Wow! This recipe is written to be made with 2 one pound pork tenderloins. Is that what you have? I can’t imagine 1 lb chops so just want to be sure I am clear what cut of meat you have as there is a huge difference between a chop and a tenderloin. A chop is similar to a single serve “steak.” If you do have 1 lb tenderloins then just make the recipe as written. Made this tonight. Very good and will be a repeat. Thank you. Hello! Your pork tenderloin recipe sounds delicious! How many people does this amount serve? I am thinking of doing this for Christmas Eve dinner with 10-14 people. Could you give me some guidance on how many pounds I would need and how long to cook it? The tenderloins that I purchased are whole weighing around 2 1/2 lbs. each. I appreciate any help you can give me!! Thanks so much!! Cook time is about 20–25 minutes per pound. But keep in mind that is for each tenderloin. If they are spaced out or in separate pans I would say about 50–60 minutes. But as always, pay more attention to the thermometer than the time. Just be sure the thermometer reaches 145º in the thickest part of the roast and let it rest for another 10 minutes after removing it from the oven to continue cooking. Enjoy! Thanks so much! I posted the same question again this morning not realizing that you had answered my first post. Please excuse and thank you so much for your help! Merry Christmas! My wife is teaching quilting this afternoon, so I’m on kitchen duty. Wanted to make lunza, a Cypriot pork tenderloin dish, but couldn’t find a recipe I liked. So yours it is. Like others I had no OJ & didn’t want to drive, so have substituted fresh lemon juice and added 1 T of brown sugar. Also did a presoak in red wine but will drain and cook in the sauce & baste as per your recipe. Happy to provide feedback…but you haven’t had a single negative yet! Cant wait to hear your feedback. Have a wonderful day! The recipe calls for cutting the 6 garlic cloves in half but one only puts 6 holes in the pork. Does putting 2 halves in the hole release more flavor than the whole clove ? Or should I poke 12 holes to spread out the garlic flavor ? Thank you. Good catch! I never noticed that mistake! I have updated the recipe. Yes, you poke 12 holes in the tenderloins. I used this recipe for a large pork loin roast and it was fantastic. I just had to up the cook time about 30 min. I am planning on making your delicious-looking recipe for Christmas dinner this year. However, I have a crowd to feed and have three 2 1/2 pound whole pork tenderloins to work with. Any suggestions on cook times? I’m sure it will take longer than the 45 minutes that you suggest for the two 1 1/4 pound tenderloins, but just don’t know how much time to allow. Your help would be greatly appreciated! Thank you!! I agree that it is not an overrated statement. It was an excellent pork tenderloin recipe, and will now be our new favourite. Thank you for sharing. Thank you so much for sharing this recipe! I have made it several times in the past year and it has been a big hit with both family and friends. The only substitution I make is organic coconut sauce (natural soy sauce substitute) in place of the soy sauce. I am going to try pineapple in place of orange juice when I make it next to see as I’ve seen in some of the other comments just out of curiosity. Three thumbs up for this delicious recipe! Mmmmmmmmmmmmmmmmmmmmmmmmmmmm!!!!!! No leftovers. Delicious! !!!!!!!!! Ok so I made this last week…. and have been asked to make it this week now LOL. Truly amazing. The flavor was good, but my marinade in the pan all burned. Any suggestions? I’m sorry that happened. It’s possible that the pan was too big. I can see how it would burn if the sauce was too thinly spread out. Try a smaller pan next time. Tried this tonight and my entire family loved it! My husband and both teenage boys said it’s the best pork tenderloin I’ve ever made – and I’ve tried making it MANY times. Thank you! All I did extra was hit it with the broiler to crisp it up at the end. To each their own. I don’t know that 1-2 tbsp of soy sauce will be sufficient for 2 lbs of meat. Tasty, I added some orange zest and put 2 Granny Smith apples and a parsnip in the pan! Lovely compliment. Can this be done the day before and refrigerate and cook the next day?? Why is there no salt in this recipe? Is it simply not mentioned? I’m afraid if I don’t season it it will be very bland. Hello, Thanks for the response to my question. I made the recipe. Holy Smokes it is the most delicious pork tenderloin I’ve ever made. It is now going to be my go to pork tenderloin recipe. Thanks for sharing it. This marinade was AH-mazing. I cook a lot of pork tenderloin, so it was nice to find another really good marinade to add to the list. THANKS! Omg!!! This was amazing and so easy to make. The entire family devoured it! They want it again next week. Thanks for the recipe. This looks great and I’d love to try it. Neither of us like rosemary. Would it take away too much from the dish if we omitted it? It looks great! is yellow mustard an option? can you do this in the crockpot? I’m sure you could but I have never tried it. If you decide to give it a go please come back and let me know how it turned out. I would love to hear. I am trying this today in the crock pot. I see that many comments have asked about it but doesn’t look like anyone has followed up. Have you had a chance to try it or heard back from anyone who has? It came out delicious in the crock pot! I made a gravy with the juices on the stove top and served it with mashed potatoes and cheesy baked asparagus. So yummy! Natalia, would you tell me how long you cooked it in the Crock Pot? Did you sear it first ? Thanks so much for letting us know how it turned out cooking it this way, And a big thanks to Diva di Cucina for the recipe. Want to try this ASAP in the oven…… as soon as I either fix it or get a new one (that’s what I’m hoping for). But till then, I will try the Crock Pot. This is quite literally the best pork tenderloin I’ve ever had. I finished my meal and found myself running my finger along the plate to get the extra sauce….sure sign of deliciousness. YUM! Can I freeze this recipe at any point? So sorry I missed your comment and for the delayed response! If you want to be able to freeze, I recommend making the marinade in a freezer bag and placing the uncooked tenderloin in the bag and freezing it together. That way when you are ready to cook it, you can just take the whole bag out of the freezer in the morning and as it defrosts it will also marinade. Then you can just pour it all into a baking dish at once and cook as the directions say. This is so delicious. Tossed sliced summer squash and zuchinni in the juices too and served with mashed sweet potaoes. This recipe is a keeper! This is how I cook my Pork Tenderloin all the time. I just love it. instead of oj i used lemon juice and placed sliced lemons on top and it was still amazing. Can this be cooked in crockpot? Made this recipe but I was nervous about cooking it a a low temperature, thought it might be tough as it is a lean cut of meat. I cooked it at 425 for a shorter time and it was perfect. The sauce did evaporate and brown in the hot oven. My husband commented on how tender it was. My package of tenderloin contained only one and weighed less. I cooked the extra marinade which we passed as sauce for the sliced meat and mashed potatoes. Delicious sauce and very flavorful meat. I will definitely keep this recipe. I made this today in the Crock-Pot on low for 7 1/2 hours. I poured the juice in a sauce pan on medium-high. I mixed 2 tbsp cornstarch and 2 tbsp water stirring into sauce pan until thickened. Removed from heat. In a skillet I sauteed mushrooms and onions in a little butter and olive oil until softened. Added gravy to skillet with 1/2 cup beef broth and simmered for 15 minutes. I used the gravy mixture on the pork and on mashed potatoes! Delicious! I messed up. Was so excited to make this. Was putting it together and realized I have pork loin not tenderloin. Do you think it will still work? Do you think I’ll need to make more sauce? My pork loin is 2 1/2 pounds. No worries! It’s just a bigger cut of meat. You will need to cook it a bit longer. That being the case, yes, I would probably double the marinade recipe to ensure there is some left over for sauce. I know some people have commented that it has cooked off and there was any left over after cooking. Can’t really go wrong with extra sauce! Hope you enjoy this recipe as much as we do! Thank you so much for the awesome recipe! I tripled the sauce,and let the pork loin marinate for a couple hours, (since it wasn’t tenderloin), before I cooked it. It was the best pork we’ve ever eaten! So flavorful, and so tender! We loved it! And it was awesome cold the next day too! I went a little heavier with the honey, baked at 425, and tripled the Rosemary and holy cow that was amazing!!! Making this tonight! Do I need to remove the garlic cloves after baking? I dont. But then again I LOOOOOOVE garlic. It almost takes on a roasted garlic flavor as it cooks so it definitely has a pretty mellow flavor. Enjoy! Made this for company last night; it was fantastic! So easy and so good. This will be a go-to recipe for sure! Just made this for dinner. We eat pork tenderloin regularly, but this may now be our favorite recipe. I didn’t have OJ and used lemon juice instead, and it was wonderful. Will make this again. It serves 4-6 adults so I would probably double it. I am thinking of making this for Christmas dinner for around 12 people. How much more tenderloin would you recommend? 2 are young girls and 2 are teens. The rest are adults. Glad you found the answer you were looking for. Hope your family enjoys it! Merry Christmas! I just made this and oh. my. gosh. This was so delicious and will be making this again soon haha. I only had one large piece of pork tenderloin, not the two pieces, so I increased the cooking time to 60 min based on other reviews and it came out great. Thank you for this wonderful recipe! Can i omit the rosemary or is their another herb that I can use instead. I may cook it without the rosemary. You can most certainly omit whatever you’d like. It’s your dinner after all. 😉 If I we’re going to substitute an herb for the rosemary I would say to try thyme. I made this tonight and my husband and I thought it was outstanding! The pork is so juicy, the marinade a perfect combination with lots to spoon over the meat. I had it with cauliflower mashed potatoes and plan to make this a staple for my family. Thank you!! I always appreciate simple and delicious!!! What a lovely review! Thank you so much for sharing. Is this REALLY really juicy? I really hate any dryness in pork if any kind. Which I often find is so true of pork. Really very juicy? Hi, loved this recipe! It will definitely be a go-to for me from now on. Just a word about the splash of citrus…the acid in citrus helps to break down the fibers in any cut of meat making it more tender and allowing a marinade or sauce to penetrate. Cutting it out or substituting a non acidic ingredient will change the outcome. Just made this tonight with my parents over for dinner. We are all raving over the dish! Thank you for the great and simple dish! I picked up some Pork Tenderloins at Costco. Looked on Pinterest for a recipe and came across your recipe through a Pin. After reading all the great comments on your web page, I was happy to find I had all of the ingredients on hand, so thought, why not. I’ve got to tell you and also thank you, this recipe is fantastic, so tender and so moist. I made it exactly to your recipe, PERFECT. Definitely a keeper. It’s in the oven right now, i used 1tbsp of Dijon mustard & 1tbsp of whole grain Dijon mustard. Can’t wait to taste this looks yummy Thank you. We LOVE this recipe. It was perfect!!! This is by far THE best recipe. My hubby and I love it. It’s a great pairing with broccoli and Quinoa and brown rice from Costco. WOW!!!! Glad you liked it! Thanks for the recommendation! I will be sure to give those side dish combos a try. I made it for dinner tonight. It was a big hit at our house! We are not big fans of sweet so I cut the honey in half (2 tbsp) and added fresh oregano, blended it the orange juice and 3 garlic cloves because I was being lazy. My pork was still a little frozen so i let it marinade in that mixture for a couple of hrs in the fridge. It was delicious and so juicy! Will be making it again many times. Thank you! You are welcome! That is the best thing about cooking, you can always adapt recipes to your needs. Thanks for sharing your comment! Cooked this tonight for the first time- was a major hit with my husband. Only made 1 tenderloin as it is just the 2 of us, but followed the recipe exactly except used pineapple juice instead of orange. The tenderloins were on sale a few weeks ago, so I bought 2 packages (4 tenderloins), put each one in a gallon freezer bag, and put my usual marinade in 3 of them but wanted something different for the last one. I ran across your recipe on Pinterest and it sounded so good, so I mixed it up and poured it into the last bag. Zipped them up and stuck them in the freezer. Took out this one this morning to thaw, tossed it in the pan when it was time to cook it, and served it with white rice, corn, and brussels sprouts. This is def a keeper for us! Thank you!! You can use a loin in this recipe instead. However, you will want to roast it longer and at a lower temperature so you may want to double or even triple the marinade recipe so it doesn’t all cook off and you have enough to baste it intermittently. Hope that works for you! This will definitely be my go to recipe from now on. Finally! The sauce was so good and the meat tender. The only thing I might do next time is sear the meat to give a nice crust to the outside. Thanks! Could you substitute turkey tenderloin? Thought this recipe was great. Very flavorful. Will make it again! Delicious! Definitely recommend making a second batch of sauce on the stove! I rarely leave comments about recipes, but this pork tenderloin recipe is amazing! So tender and flavorful, and it honestly couldn’t be easier. Foolproof and fabulous! Thank you for posting! !